Good bye to my Fashion Mashie wardrobe $5 a piece. 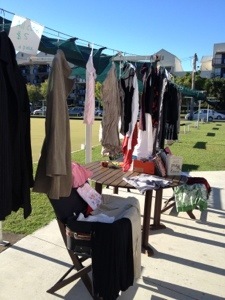 I’m at Coorparoo Bowls Club’s Car Boot Sale today – it is time to sell the things that didn’t go to the RSPCA. We dropped 4 bags off at their thrift in February and today is part 2 of getting ready to buy more clothes. I obviously broke the habit but I am starting a new job in a week and I would like to buy some new clothes for my fresh start. Just need to make some money so I can afford to shop again! 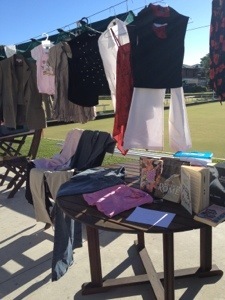 Posted in Agnes B, Aussie Designer, Brisbane Fun, casual, Cue, Dogstar, fashion, jeans, Laura Ashley, vintage and tagged Car boot sale, Coorparoo Bowls Club, second hand. Bookmark the permalink. Well this is it – the last outfit on the last day. That’s officially 366 days of different outfits every day from one wardrobe with no shopping. Some days there have been two or three outfits and none of them have been repeats; some days I haven’t blogged every outfit but at least one has been every day for the year. 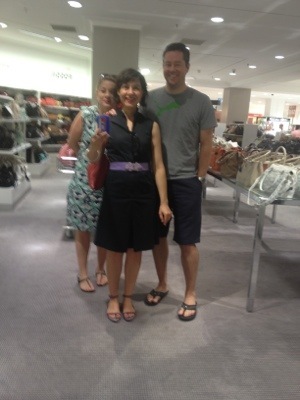 The no shopping went really well – and I have made confession blogs for the things I did buy! 1) a great dress from my local supermarket on Day 4 that just got tonnes of wear! 3) my outlet shopping in the States that’s in a bag ready to break out TOMORROW! Whatever will I choose? So what can I tell you about this outfit? Well the theme at Coorparoo Bowls Club’s NYE party is New Orleans Bourbon Street blues bar so I knew I needed something to party in. I’m kicking off the night with family dinner and then will get to the bar in time to kiss my gorgeous man at midnight but my family don’t mind a bit of fancy dress! This top was a gift from a woman I used to work with in Hong Kong who had two sons and always wished for a daughter. I was lucky enough to fill that gap for her for the four years I worked in Hong Kong. Due to its very sparkly nature it doesn’t actually get out very often but I thought tonight was the perfect opportunity. 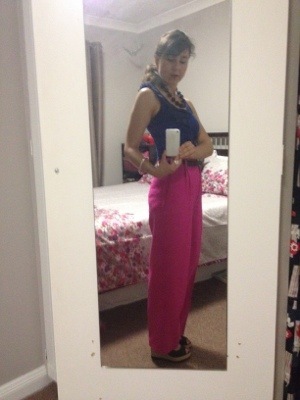 These pants are one of many hand-me-downs from my gorgeous, glamour aunt who nobody believes actually exists! She had them made in the 1980s. 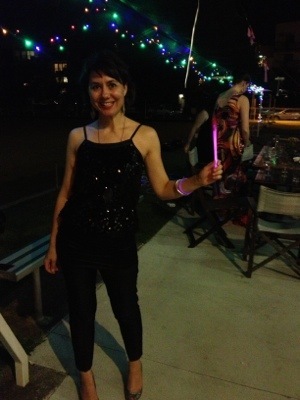 I started my blog 366 days ago on new years eve as I entered 2012 in my hot pink pants and bright blue shirt so I’m taking out the year in sparkles and celebrations. Thank you to my blog followers, Facebook followers, friends, family and everyone who has added to my wardrobe over the last 20-odd years (yes, that’s how long some of it has been around) thank you for your support, thank you for following, thank you for telling me that my blog has inspired you to shop your wardrobe and see what combinations there are and how fun accessorising can be! Thank you to those who told me my blog was worthwhile and it wasn’t just something silly and girly to do this year but something that has made people realise that we do shop too much and we can make tonnes of outfits from our wardrobes and that handing down clothes will make more stories and more exciting wardrobes. Thank you to all of those who have decided to take some time off shopping as well, I hope that the time was rewarding both monetarily and also in a way that helped you realise that your wardrobes have lots to offer. Even though only very few of us have lions and witches in our wardrobes, there are still some fabulous things, some wonderful stories and history, to be found when we dig through and play. Thank you to all of you who have given me hand-me-downs over the years. I can’t wait to wear anything that I received after mid-year as I haven’t worn any hand-me-downs since the middle of the year. Nothing added but lots gained. And finally thank you to everyone who has taken photos for me throughout the year. I know it was painful and I really, really appreciated it especially those who were asked on multiple occasions: like Mum and Kaylee and every other day it was Tony who used all his creative inspiration to help make my blog photos more interesting and got me out from in front of my mirror! Here’s to the great purge that starts tomorrow, starting with anything that has a hole! Interestingly that is mostly stuff bought in the last few years … And remember the last few years in my wardrobe is about 10 years! Here’s to 2013 – HAPPY NEW YEAR! 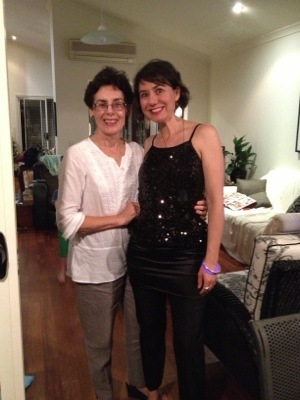 With my glamour aunt who gave me these pants – she is real! Happy new year! May it be bright and shiny and full of fun, love and wonderful surprises. Posted in Brisbane Fun, casual, character outfit, fashion, hand-me-down, vintage and tagged dress up, New Year's Eve, no shopping, party, summer, wardrobe workout. Bookmark the permalink. Spending the last day of the year watching my siblings sale shopping! Well just getting to hang out with them which is a treat. My afternoon is at the movies with my niece and nephew to finally see Rise of the Guardians. I needed something super comfy and cool with a cardigan option for the cinema. I bought this groovy 60s kinda dress in Hong Kong and wore it in winter with a long-sleeved T and tights so today it gets to just chill out with me. 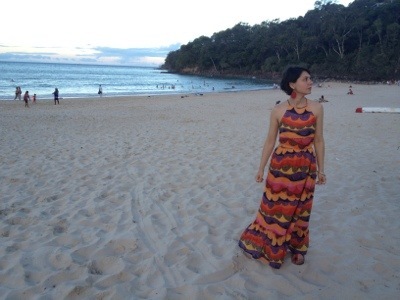 Posted in Brisbane Fun, casual, fashion and tagged summer, wardrobe workout. Bookmark the permalink. Sportsgirl shorts and a pink top that, I just realised, has just been to its third massive family occasion. I bought it in Worcester, England when I was working there at a summer school. After my Dad died in 2000, I moved back to Australia and a month later it was my birthday so I had a family birthday party to get everyone together for a happy reason. We went to Pancake Manor and had a pancakes in pink party and I wore this top. Then, in 2004, we had a family reunion at the beach with all of Dad’s side of the family. We all got together from all over the world and I wore this top. We had a classic photo with me and my cousin and a family friend who were all born within days of one another and all lived together at different times in our young adult life. The others are tall guys and I look mini between them in this top before I started trapeze and got these bulging shoulders I have now;). And finally today we got together at Coorparoo Bowls Club with old family friends, school friends and family to catch up while my siblings are all in Brisbane. It seems fitting that I should wear it! I only thought of it because I saw a woman at the beach wearing a top like this with little shortie shorts and it looked fab. I think I will still try that … When I’ve done a bit more exercise! 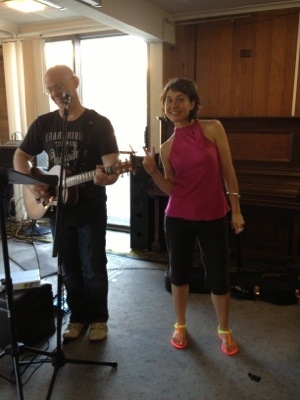 Just to round off the reunion feel my great old friend Cal was the musician today! Hurray! Posted in Brisbane Fun, casual, fashion, Sportsgirl and tagged Coorparoo Bowls Club, Family, Holidays, summer. Bookmark the permalink. This funky top is in my all time most favourite great buys list. On a trip to the Valley Markets circa 2002, I came across the Ortarky stall and I loved this top. I knew it would be a conversation piece, different from everyone else’s summer tops and that I could show off Brisbane-made creativity wherever I went – all very important criteria for me. Rumour has it that Ortarky became Nelson Malloy but I must investigate that further. 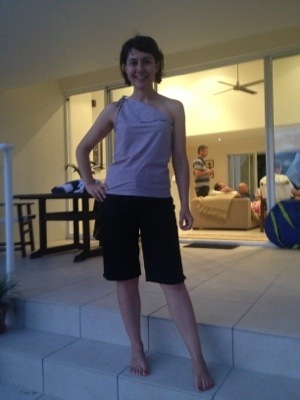 Anyway, after the storm yesterday it was still steamy this afternoon and I needed something cool to wear for cousins catch up barbecue so paired with Esprit dress shorts and bare feet it all balanced out. Posted in Aussie Designer, casual, Esprit, fashion, Nelson Malloy and tagged Collar, Holidays, Nelson Malloy, Ortarky, summer. Bookmark the permalink.